It's Day 3 of My Creative Time Sneak Peeks, and I'm so excited to share the adorable Stitched Chunky Jar Dies and the Chunky Jar Accessories with you! I absolutely love the shapes of the jars in this set, and the little accessories are too cute! Today I made a 4 1/4" square card, and I stitched together my patterned and brown layers. I die cut my jar with white cardstock and then again with clear cardstock, sandwiching a butterfly from Chunky Jar Accessories in between, before machine stitching them together. I used two more dies to cut my lid out of a scrap of patterned paper and my "fabric" out of actual fabric! I am in love with these little accessories! How sweet are these keys, die cut with silver paper from The Paper Company? And this little tag comes with lots of sentiments that are just the right size! I think these accessories will be turning up on tons of my future projects!!! *** This time around we are doing something a little bit different! All you have to do is leave comments on our blogs! You do NOT have to comment on every blog. BUT, if you do, you will just have more chances to win! The thing we are switching up this time is that Emma will be picking a winner each night and announcing the winner the next morning! Example: for Monday's sneak, leave your comments here and share on Facebook, and then Emma will announce Monday's winner on Tuesday morning! That means a winner will be announced every day during sneaks! *** SPREAD THE WORD TO THE WORLD ON FACEBOOK about this release and to whatever connections you may have! Let us know on "My Creative Time's" FB page here that you did so! OR you can just tag Emma in your post! Log onto your Facebook, and let's start spreading the word! And be sure to stop by My Creative Time to see what Emma and the rest of the design team have for you today! Love this! Oh I must have this set! Such an adorable card Katie!!! I LOVE the papers you used and these stamps and dies.....awesome!!! 0H Katie how beautiful and precious is your Mason jar. Gosh what a great idea and who didn't as a kid catch a butterfly in a jar. I just love the colors you used just beautiful. You are so creative and talented. The butterfly, jar, and card are all gorgeous!! This caught butterfly and jar are gorgeous. OMWord, but this is such a cute card! I so love this jar and I love, love those keys! This release is just to awesome!!! I can't even imagine what would be left for tomorrow?! lol Love, love everything!! This is a great card - I like that you used actual fabric... that is very creative! This is beautiful! LOVE that you used actual fabric - and the silver paper for the keys? Genius!!!! I am getting this set for sure!!! Great card Katie. I love how you used actual material on your jar, so cute. This is an awesome release!! Great set, I haven't seen a thing in the collection that I would not like to add to mine. Thanks for the lovely share. Beautiful card! Like that you used real fabric for the fabric die. Thank you for sharing. OH my word I love this little jar just adorable - loving the cute little butterfly. GREAT job. great job with theseKatie!!! love the colors you used!! Very sweet card--I like the silver keys. Wow, very cute card, I love it, thanks for sharing. Love your cards. Great job. 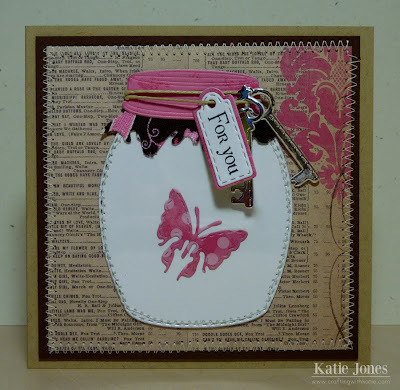 Love those keys and butterfly with your card and jar die. This is absolutely Beautiful! I love that you cut actual fabric for the "fabric"...how clever. Your card brings back memories of when I was little and used to collect ladybugs in a jar. Very nice card! TFS! This is adorable! I love the keys and the way you used the pattern on the butterfly. Beautiful card!! LOVE this jar die set!! Your jar stands out nicely against the paper. Love how your flourish trim matches the jar accessories. Gorgeous card, love the papers you used. Just beautiful Katie!! I love the ALL the details. Your stitching is fantastic, the colors are gorgeous, and those keys looks so awesome!! Oh, and I love that you used real fabric... it's all just amazing!! So pretty!! I love that you used real fabric...makes it so much more authentic:) You did an amazing job...thank you so much for sharing!! So gorgeous, Katie! 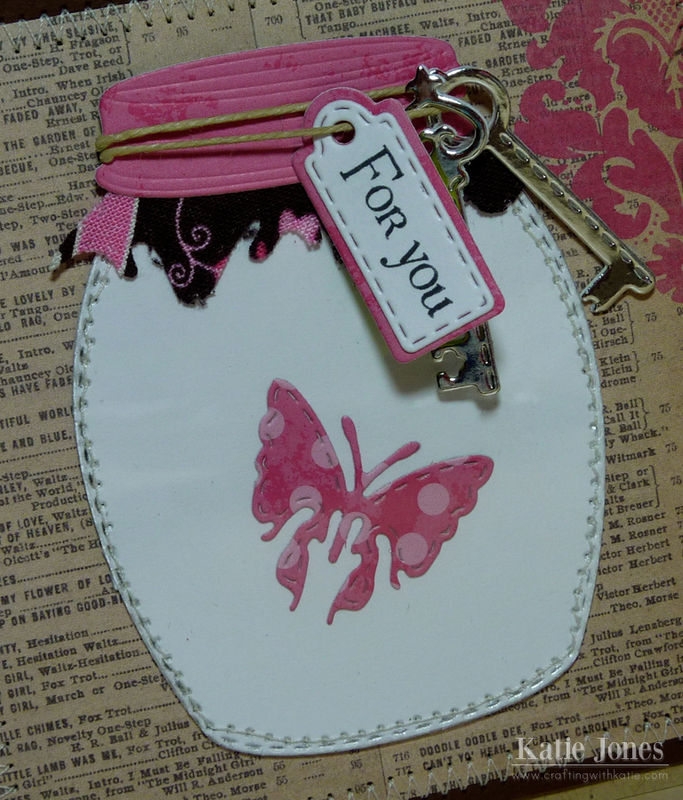 I love the stitching, fabric, butterflies, jar and keys. love the jar,its awesome,like the pattern for background to!!!! Such a pretty card to showcase the new release. The keys and jars = swoon! Thank you for sharing and inspiring. Katie fabulous card! Love those keys, cant wait for the release. Beautiful card! I love the jar and butterfly dies! 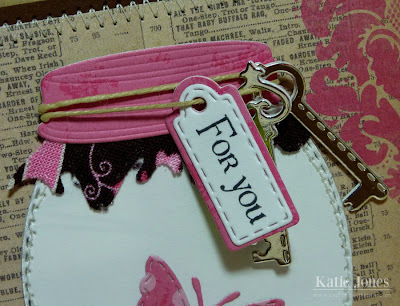 Gorgeous card, love that you used fabric. Love your project! Looks like a wonderful release! Come on Friday! Not one but two keys and they look like real ones with that special paper. So cool to use real fabric and to stitch the clear so the butterfly is inside the jar. Love the fabric on the jar, very pretty. This die set is so cute & I really want it & the accessory set. Beautiful projects! The jars and keys together are so cute. Stunning card!!! I just can't wait to see the entire set of jar accessories. They look fabulous in the peeks. beautiful! love the papers too! awesome job! Love those new dies. Beautiful card. This is so pretty, I love the mix of paper and fabric! Love it! That butterfly is one of my new favs!!! Katie ~ I ADORE this card! the jar is so FAB! The silver keys, the butterfly and of my the background paper ~ EEK! Plus you had me at stitching around the card and on the jar!!! Awesome creation!